Primary Socialization (when your puppy is 3-16 weeks of age) is the developmental stage in which puppies are beginning to build their worldview. They begin their social relationships with dogs, other animals, their family, strangers, and the environment around them. During this window, they habituate to their surroundings. This means that how the world appears during this time period will become what your adult dog considers “normal.” Positive, safe exposure to novel people, places, animals and things during this time will teach your growing dog that novel experiences are fun and good! But what happens if your puppy has an experience that isn’t fun, or they seem scared of people, places, or other animals? Your puppy first starts to show fear and uncertainty roughly around the time they come home with you – about 8-12 weeks, toward the end of their socialization window. This is normal, as your puppy is learning what’s dangerous and, hopefully, what’s safe! Some uncertainty is expected during socialization. And some behaviors are warning signs of potentially more serious problems. So how do you know if the behavior you’re seeing is typical and a normal developmental stage, or a possible red flag for issues down the line? Genetics play a large role in puppy behavior – young dogs are not clean slates. If mom, dad, grandparents, or other dogs in your puppy’s familial line have fearfulness around people, your puppy may be more likely to display these traits. A puppy who is developing typically will greet new people with confidence, moving forward eagerly with a loose wiggly tail and body, or may show brief nervousness or uncertainty on meeting new people, but will quickly overcome that fear and become relaxed and wiggly, playful and/or approach them with obvious curiosity and interest. Atypical puppy behavior would be: hiding behind you, moving away, barking, standing still and moving slowly forward and then moving away again quickly, or hiding behind objects (such as under chairs or tables) when they meet new people. Genetics play a large role in puppy behavior – young dogs are not clean slates. If mom, dad, grandparents, or other dogs in your puppy’s familial line have fearfulness around people, your puppy may be more likely to display these traits. Little puppy barks (aka “woof!”) can be so cute, and it’s funny to think of an 8 week old puppy trying to be fierce or dominant toward other dogs or people. However, this behavior is a red flag if you’re seeing it consistently. It may be cute when they’re 10 pounds, but how cute will this behavior be when you have a full-grown dog who is lunging forward, barking, with their hair on the back standing up? If the behavior would be concerning when they’re an adult, it’s time to take note of what’s happening before they grow any bigger. Some nervous body language is a-ok while your dog explores the world. We often see puppies meeting new situations by leaving their back legs extended behind them – it’s like leaving a lifeline or escape route. Pretty quickly, though, you should see those back legs catch up with the rest of your puppy. Stiff, uncertain tails become loose and wagging, and tight body postures relax and soon their whole body is wiggly and loose while they explore. Effusive displays of fear such as high pitched continuous screaming/barking, shaking, defecating, urinating, or fleeing (without returning to investigate) are all signs of extreme fear. In any new situation in which your puppy is nervous, we expect to see a quick recovery and confidence as they explore. Over time, meeting new things should be fun and exciting, and you’ll notice your puppy explores more quickly and readily each time. 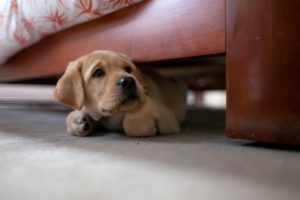 If your puppy continues to be hesitant and nervous with each novel experience, or repeatedly nervous with items or people they’ve seen before, this can be a red flag. But won’t they grow out of it? With young dogs, this is often our hope – this is just a phase, it will get better as they get older. And in some situations, they may. The risk with a-typical fear, however, is that it is not a phase. It may be a genetic predisposition or the results of an early trauma, both of which will generally not go away without professional intervention. If you are at all uncertain, or find yourself thinking “Hmm…maybe he’ll grow out of it,” there is help! You can give us a call. Intervention while your puppy is still in their socialization window can be extremely effective, and starting while they’re young will help you get a handle on behaviors before they become extreme. Our staff can help you determine the right route to help your puppy grow into the best dog they can be, and we’ll be beside you every step of the way. Click here to contact us. Check out the mini-books “I’ll Be Home Soon,” “Feisty Fido,” “The Cautious Canine” and “The Puppy Primer,” all by Patricia McConnell, PhD.